Hole number 5 is an undulating uphill par 5 of 399 metres. It is stroke hole 1 for men and 5 for women. From the No 5 tee, players generally use a wood to hit towards the rise directly in front. The entire fairway on the left is flanked by pine trees which are hazard all the way up ! On the right of the fairway the pine trees shield the 6th fairway and if you end up over there you have to play up that fairway. 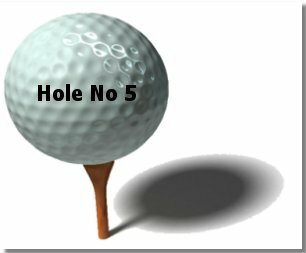 Accuracy is the key to this hole as straying off the fairway in either direction will result in problems for the wayward golfer. The fairway slopes to the left early on and in summer balls will travel to the left very easily. The green is small and sloping back down the fairway.